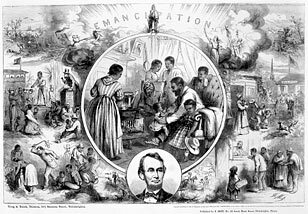 Engraving depicting the second, and better known, emancipation of Southern slaves, under Lincoln's Emancipation Proclamation of 1863. See the next slide to learn how Lincoln's act drew on the history of the Black Seminoles. Library of Congress, Prints and Photographs Division, LC-USZ62-2573. "[T]hat all Negroes the property of the Seminole...who...delivered themselves up to the Commanding Officer of the Troops should be free." It was remarkable. By making a battlefield decision to offer freedom to blacks who surrendered, Jesup enacted the first and only emancipation of rebellious blacks on American soil prior to the Civil War. The largest, most organized, and most violent slave uprising in U.S. history had produced a concession of freedom. In essence, the Black Seminole portion of the uprising was a victory.